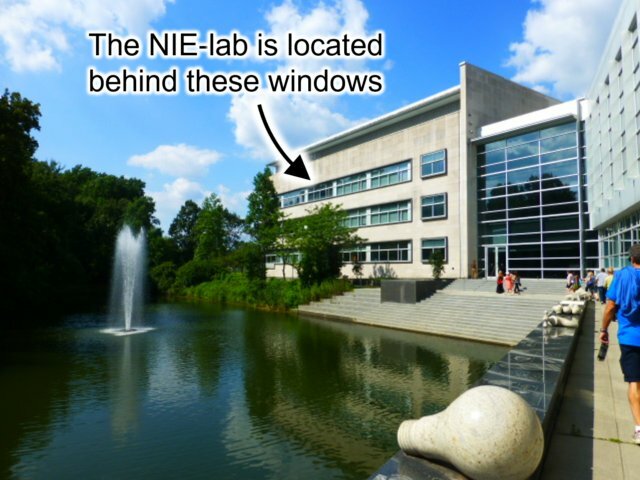 Welcome to the NIE-lab! In our group we research phenomena that occur when two immiscible liquids are brought in contact with each other. We develop new materials that help to solve global challenges such as providing clean drinking water, preventing corrosion of metals and powering the transition from fossil to renewable feedstocks for the production of fuels and chemicals. 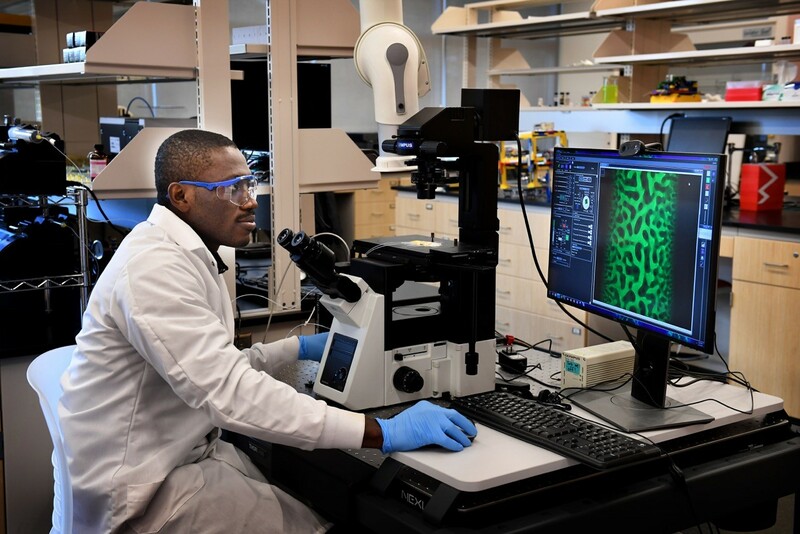 The lab is located in the College of Engineering at Rowan University in Glassboro, NJ, just 20 miles south of Philadelphia, PA. Rowan University is classified a comprehensive public research institution. In the spring of 2017 the College of Engineering has opened an extension building and together with the finalized renovations new and dedicated laboratory space has been created for the exciting research in the department. This object is called a vesicle or liposome. It has a thin shell made of phospholipids and is loaded with tiny particles. We call these pregnant droplets: They are made of oil/water shells and release a baby oil droplet. Tomography of a bicontinuous oil/water structure: Blue regions are water, green regions oil. We call this a bijel. 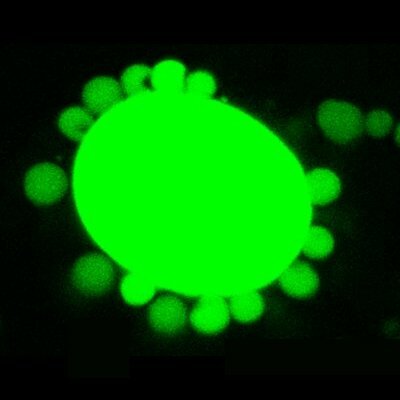 These are tiny droplets that can move around on their own. Their propulsion is caused by a phase separation inside the droplets. Microscopic polymer containers with a biocompatible shell. They can be used as tiny drug delivery capsules. A schematic of phase separation in emulsion droplets leading to the formation of concentric oil/water layers. Droplets pinch off from a nozzle. 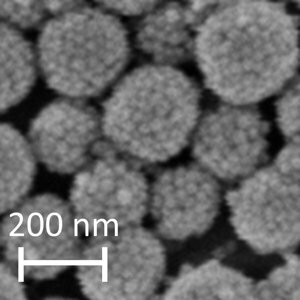 Both undergo a phase separation of oil and water, but the second one also contains surface active nanoparticles. A droplet undergoing phase separation to produce five concentric oil/water layers. Tomography of a messy packing of oil droplets. The droplets have been produced by microfluidics and have all the same size. We call them sweet-potatoes: They are microscopic particles made of an oil/water scaffold. A tomographic scan through a curved fiber made of a oil/water scaffold. These are liquid fibers and you can see how a green dye travels throughout their structure with time. Here you see a large oil droplet with many tiny oil droplets sitting on its surface. Again a large droplet with small droplets on the surface. The small droplets can attach and detach from the large droplet on command. This long lasso is actually made of a liquid stabilized by nanoparticles and undulates in a channel due to hydrodynamic forces. These are oil droplets stabilized by nanoparticles. They have been fabricated in a way that makes them elongated in one direction. An ultrathin scaffold of phospholipids holds this strangely shaped oil/water structure together. While this droplet shrinks due to evaporation phospholipids self-assemble to stabilize this applecore-shaped droplet. A 3-dimensional reconstruction of a thin film composed of interconnected oil/water channels. Electron microscopy of the surface of a bicontinuous polymer structure stabilized by nanoparticles. 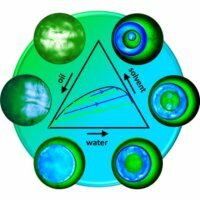 Tomography of an ordered packing of oil droplets. The grain boundary of different types of crystalline droplet packings is shown. 3-dimensional reconstruction of polymer coating on a metal. Tiny capsules filled with corrosion inhibitors are embedded in the coating. 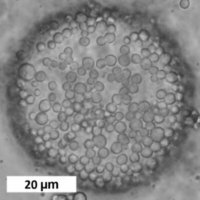 Cryo-electron microscopy of an oil droplet covered by a thin crust of nanoparticles. 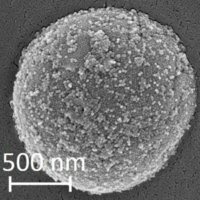 Ultrasmall oil droplets with nanoparticles on their surface.